This is a curriculum reward system for gymnasts based on progressive skill development that is used for Kindergym, Minigym and Villager classes. Each 6 to 7 weeks, the instructors test the progress of each child and during the class of the 8th week they receive appropriate stars to take home and place on the poster that is given to them. This program breaks skills down into a simple form which is very beneficial to the gymnast who struggles with whole skills. In addition, because of the simplicity of many of the skills, a gymnast may be rewarded with many stars. When a level is completed, the gymnast receives a certificate and a picture with their instructor. Each structured class begins with a 15 minute warm-up that involves flexibility and strength activities. Following the warm-up, there are (3) 15 minute rotations which will include floor exercises, balance beam, uneven bars, vault and TumblTrak or trampoline for girls and floor, vault, parallel bars, rings, pommel horse, TumblTrak or trampoline for boys. The instructor spots the most difficult station and the students are encouraged to work independently at the other stations. Class ratio is 7 to 1. One of the goals is to enhance the 'feel good' feelings of each child through positive reinforcement. Expectations of the skills, although still on a limited basis, are greater than for the preschoolers. For example, a forward roll should be performed with feet together from start to finish. A cartwheel should have legs starting to go over the head. Each gymnast should begin to challenge themselves toward the end result of completing a skill successfully. Each structured class begins with a 15 minute warm-up that involves flexibility and strength activities. Following the warm-up, there are (5) 15 minute rotations which will include floor exercises, balance beam, uneven bars, vault and TumblTrak or trampoline for girls and floor, vault, parallel bars, rings, pommel horse, TumblTrak or trampoline for boys. The instructor spots the most difficult station and the students are encouraged to work independently at the other stations. Class ratio is 8 to 1. It is at this level that the skills may significantly increase in difficulty. 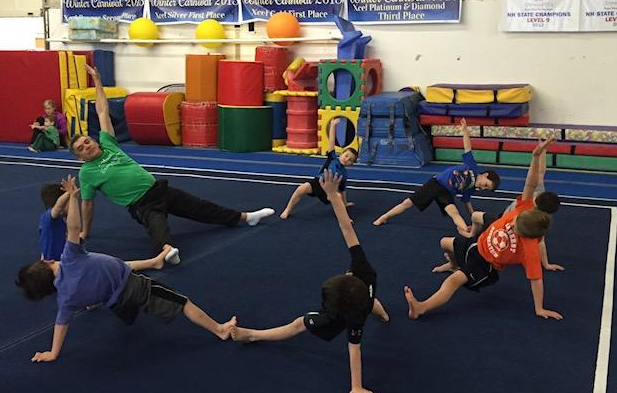 Classes are divided according to abilities and each gymnast should work to their fullest potential. The children should be focused on skill advancement while enjoying participation. Each structured class begins with a 15 minute warm-up that involves flexibility and strength activities. Following the warm-up, much of the class time will be spent on the trampoline and the TumblTrak with additional time on either the floor area, in the "pit" gym or on the regulation floor area. Class ratio is 8 to 1. Goals for this class are to improve skill development on the floor. Each gymnast should be coming into class with some prior experience and a basic working knowledge of floor skills. “Ninja Challenge” is an obstacle course based program similar to America Ninja Warriors as seen on TV. Ninja Challenge incorporates basic gymnastics skills, conditioning and flexibility. Each class will include some traditional apparatus, as well as many other pieces of equipment, such as the climbing rope, spotting blocks, wedges, balance beams, etc. Students will be encouraged to beat their personal best when traveling through timed obstacle courses. Our goal is to improve each individual’s overall fitness and athleticism. Several Ninja Jam sessions are provided throughout the year to give our Ninja's the opportunity to compete. These Jams are optional and cost extra to participate in.